It’s been a couple years now since almond milk reached mainstream status (you know something is no longer a “trend” when Starbucks adds it to the menu), and even though other alt-milks have entered the market, the love for the nut milk is still going strong. There are a lot of major benefits to choosing almond: It’s high in vitamin E, calcium, phosphorous, iron, magnesium, zinc, selenium, copper, and B vitamins. The not-so great news: Many brands add other stabilizing ingredients, like gums and carrageenan, that can be difficult for some people to digest. It was a frustration two friends who worked in the food industry shared, and they decided to do something about it. Thus NüMilk, a make-your-own almond milk machine launching in select Whole Foods, was born. “We just thought there had to be a better way to go about it,” says Ari Tolwin, one of the co-founders. Tolwin and his co-founder Joe Savino enlisted an engineering firm to build an almond milk machine that fixes that problem. Here’s how it works: You grab an empty bottle, located right next to the machine, and decide whether you want unsweetened almond milk (where the only ingredients are literally almonds and water) or sweetened almond milk (which has water, almonds, and a hint of maple syrup). Then, you press the button matching your preference, and…that’s it. “The machine grinds the almonds and then mixes it with filtered water and organic maple syrup, if the customer chooses to add sweetener,” Tolwin explains. The whole process takes 30 seconds; the retail price is $3.99 per filled bottle. Besides better ingredients, NüMilk’s founders were also hoping to make a more sustainable model. “There’s a tremendous amount of food waste throughout all the food supply chain,” Tolwin says, something that he’s seen first-hand working in the food industry. “According to the United States Department of Agriculture, there’s $91 billion of dairy that’s wasted every single year.” Most industries manufacture goods in multiple facilities, and then ship their products long distances to land on store shelves. NüMilk, however, basically only requires a supply of almonds and water; the “processing” and packaging is done in-store, directly by the consumer when they’re filling up that bottle of freshly-made milk. While NüMilk’s model still relies on almonds (which require lots of water to grow and are generally only produced in California) Tolwin says that by reducing the amount of steps between raw material and finished product, the company generates less unnecessary waste. NüMilk partnered exclusively with Whole Foods to get their product into consumers’ hands. “Our Northeast regional team met with NüMilk almost two years ago when the concept was more theoretical than anything,” says Chris Manca, a local forager for Whole Foods Market’s northeast region, whose job it is to seek out new products for the stores to stock. “Based on what they showed us then, we immediately identified it as something unique and innovative that our customers would enjoy.” Manca says Whole Foods worked with NüMilk for the past two years to get the concept ready to pilot in a few New Jersey stores at the end of 2018. But no need to trek to New Jersey to get fresh nut milk. 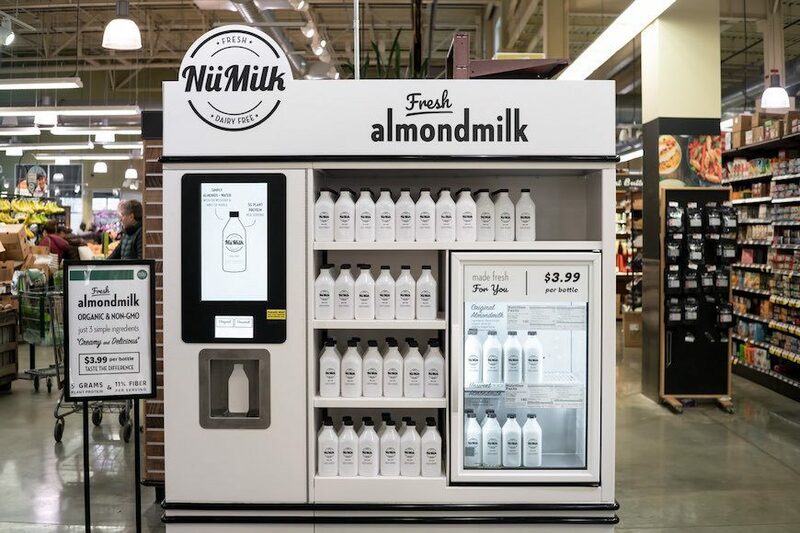 Besides Paramus and West Orange, New Jersey, Whole Foods will be adding NüMilk machines to more store locations throughout the Northeast region in 2019, including the Upper West Side and Williamsburg in New York City by the end of March. A San Diego, California location is also in the works. So, can you expect to see options for oat, macadamia, and other alt-milk options rolling out? Tolwin says not to count it out. While their focus right now is on almond milk, they are already looking into other plant-based milk options for the future. Because one thing’s for sure—the alt-milk revolution isn’t stopping anytime soon. While you wait for your local Whole Foods to get a machine, try making your own cashew milk or macadamia nut milk.